A directory of VA Amish barn sellers Outdoor structures have become a need for more and more American households, be it to combat clutter or just provide outdoor storage for tools and gardening equipment and supplies. And if you’re looking for a reasonably-priced, quality outdoor storage option, you might consider an Amish-built barn. Amish have settled the Old Dominion State sporadically, with a handful of settlements appearing over the past two decades. Despite the relatively low population of Amish in the state, a number of Amish barn dealers can be found in convenient range of major Virginia cities, including Richmond, Virginia Beach, Norfolk, Lynchburg, Chesapeake, Roanoke, Charlottesville, Alexandria as well as the Washington, DC area. Scroll down for VA Amish barn listings, or find Amish barns in other states. An Amish-owned storage building business carrying a range of outdoor structures, located in the southern VA Halifax County community. Amish made quilts and furniture business also on the premises. Absolutely Amish Structures is a family owned and operated business, offering barns built by skilled Amish craftsmen. All of their outdoor structures are available in a broad choice of designs, sizes and colors of shingles, roof, siding and trim. Absolutely Amish Structures is located roughly halfway between Washington, DC and Richmond. Byler Buildings is a family business established in 1977. They offer a range of indoor and outdoor products such as sheds, playhouses, animal shelters, gazebos and a full line of furniture. Customizable Horse barns, Economy barns, mini barns and high wall barns come in a range of options including custom window placement, wood or poly lumber flower boxes, vinyl shutters, cupolas, vents, lofts and much more. Byler Buildings is located one hour southwest of Washington DC. Alan’s Factory is a Virginia supplier of Amish-built outdoor structures such as sheds, gazebos, barns, garages, pergolas, 2-story buildings. Amish Prefab Modular Horse Barns come with heavy duty corner hooks, optional feed and tack room, wooden gable vents and ridge vent, metal roof or shingles and more. Free delivery to 30 local counties in Virginia. Crowder’s Buildings is a Richmond area supplier of Amish outdoors structures. They carry a range of products hand-built by Pennsylvania Amish manufacturers. 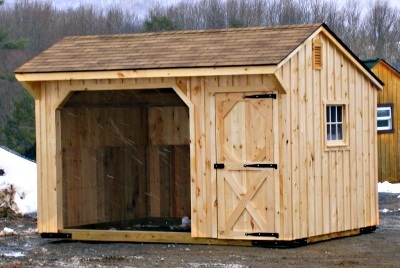 Wood, vinyl and economy storage barns come in a variety of models, colors and size options. Amish Direct Connection is a family owned and operated business. They provide an ample choice of Amish-crafted outdoor structures including sheds, cabins, gazebos, pool houses and swing sets. Their selection of mini-barns includes a few building options such as wood or vinyl material, along with 13 wood and 9 vinyl color choices and different sizes. Barn models include Dutch style and Classic little red barns. Please verify hours of operation of VA Amish barn sellers above. Business locations and hours may change. Amish-owned businesses will be closed on Sundays given Amish religious belief. However, non-Amish barn dealers may be in operation. Not responsible for changes to the above information. Amish barns can be purchased in Virginia in a number of ways. Most potential barn buyers like to visit a dealership in order to see a variety of structures at one time. Amish barn dealers can often assist in ordering a custom-made structure as well. Some Amish barn sellers offer online ordering as well as delivery within Virginia. A final option is to buy straight from an Amish source. Besides the Amish communities in Virginia (see below), Amish in communities in neighboring states, such as Lancaster County, offer a source of barns and outdoor structures as well. Amish can today be found in a half-dozen locations in western and south-central Virginia, from the mountainous land of Giles County in the Appalachian mountains to Halifax County near the NC border. While the Virginia Amish population remains low, the state has proven attractive for new settlement in recent years. Some Amish communities are home to Amish barn and outdoor structures, though not all sell directly to the public. Below, some of the Amish locations in Virginia. For more information, see our article on Amish in Virginia. Halifax County (Nathalie): In this small community of Delaware-transplant Amish, at least one Amish outdoor structure builder can be found (see listing above). Giles County (Pearisburg): A small, scenic settlement located in the mountains of western VA. Looking for information on amish builders that may be contracted to build on site. Looking for possibly a structure 24×40 2 stories in height. Most likely wood pole building with metal siding. Any info would be appreciated. 443.974.3898 The desired area is in Buckingham county Va. Looking for team to build a 6 stall 36’x36′ horse barn in Unionville VA. Summer 2019. Doug 540-834-3030.